Ha~ Probably not! But I think that you are truly a blessed woman to have a husband who is willing to serve as a dishwasher, persnickety or not! Not exactly sure what’s going on, but have you tried LEMI SHINE? My dishes were cloudy and yuck due to hard water. This stuff cleared it right up. I sound like a spokesperson for the company but really am not. Thanks for the tip! Actually, it’s a draining issue (NOT draining…) but am keeping my fingers crossed because it’s been on a good run for a few weeks! When I use the dishwasher, our electric consumption spikes. I guess ours is not a very good model. 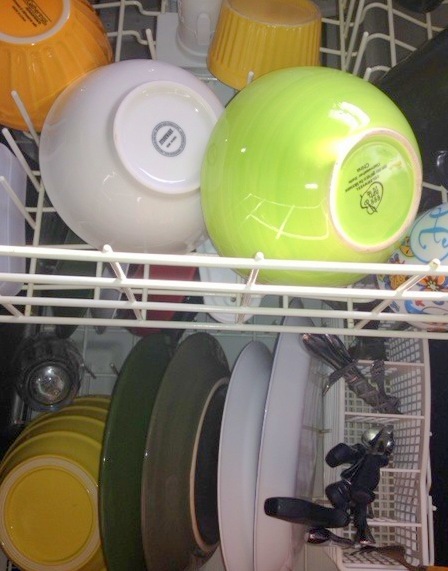 Those Dishes Won’t Do Themselves (And Neither Will The Laundry) | Love.Books.Coffee.